Live in Public Spaces - taking-on being human in public! LIPS is a site-specific dance improvisation duo & social research initiative. Taking on being human in public and exploring the life of a public space. LIPS responds to what's there and risks what's allowed. What is it to be really human in public or is this only reserved for our private lives? Do we even want to be fully seen? And how do factors of class, culture, age, gender and religion affect this. What does the context shake up in us to create these fleeting performative interactions. As humans, we have a capacity that far exceeds that of our own and the socially accepted parameters of public behaviour. This is vitally intriguing to LIPS as artists and movement researcher/educators, as is humanity's inherent & precarious relationship to movement. We are drawing attention to the endless possibilities of being and moving in an environment, as well as aspects of a public space that might go unnoticed or be disregarded but inevitably we are playing at the edge – sometimes ours and certainly others. What is it to be seen potentially as an irritant, drug addict, a mad attention seeker, desperate artist - to acknowledge that potential interpretation and continue regardless. Can we be in conversation rather than confrontation with our context? Quite simply, we are asking – why can’t we move more freely, dance more? Our choreographic sense, spatial design and structural considerations come alive in a public context. We delight in how our actions might compliment, contrast or highlight the city scape. 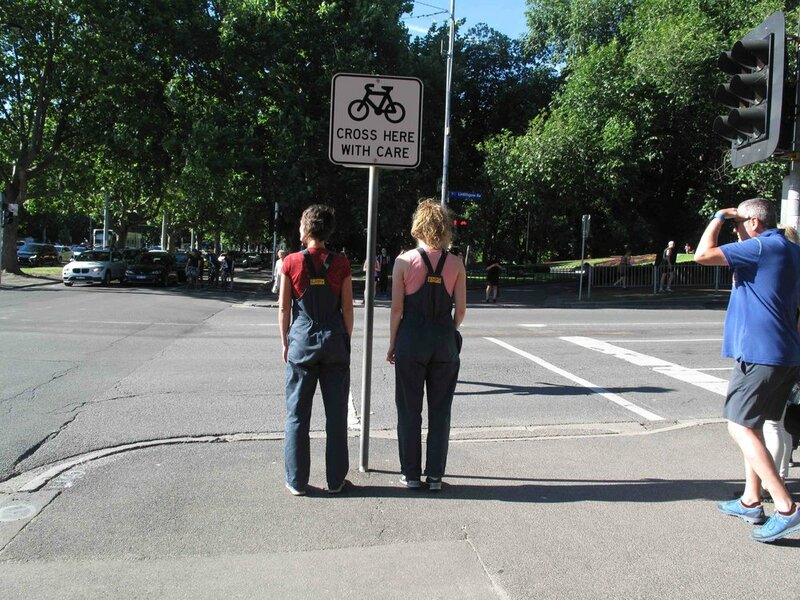 A location is chosen for it's dynamic intersections, durable overalls are donned. LIPS arrive at the designated spot, scope it and begin. A series of scores, parameters and timeframes are set as they go, in duet together. LIPS are in response to their environment - who and what’s in it and an audience in flux, undefined, willing or not. These performers are perpetually negotiating and recalibrating a bubbling, perambulating site and self. We perform fortnightly on Mondays 12-1pm at locations around Melbourne and sometimes of an evening or weekend. Jump on our facebook page to find out when and where if you're keen to come watch a performance.